Would knowing your genetic risk for dementia change the way you behave with the NHS? Various funding mechanisms for long-term care for dementia have come under scrutiny, including private insurance, drawing on the experience of various jurisdictions (e.g. Hayashi, 2013). An insurance contract is a contract whereby, for specified consideration, one party undertakes to compensate the other for a loss relating to a particular subject as a result of the occurrence of designated hazards. The normal activities of daily life carry the risk of enormous financial loss. Many persons are willing to pay a small amount for protection against certain risks because that protection provides valuable peace of mind. The term insurance describes any measure taken for protection against risks. In an insurance contract, one party, the insured, pays a specified amount of money, called a premium, to another party, the insurer. The insurer, in turn, agrees to compensate the insured for specific future losses. The losses covered are listed in the contract, and the contract is called a policy. You can often have more information than the person with whom you enter into a transaction – or vice versa. This is a potent phenomenon called “information asymmetry”. Following the seminal work by Arrow (1963), the notion of information asymmetry have by now been recognised as a cornerstone of modern insurance theory. George Akerlof was the the author of a landmark study on the role of asymmetric information in the market for “lemon” used cars. His research broke with established economic theory in illustrating how markets malfunction when buyers and sellers — as seen in used car markets — operate under different information. This seminal work has had far-reaching applications in such diverse areas as health insurance, financial markets and employment contracts. It could now impact on the way the National Health Service acts in the future in implementation of “needs based commissioning“. In 2001, Akerlof shared the Nobel Prize in economics with A. Michael Spence of Stanford University and Joseph E. Stiglitz of Columbia University for their contributions to the analyses of markets with asymmetric information. Health economists, not least Prof Julian LeGrand of the LSE, in the frenzy of New Labour and subsequent English administrations have been hell bent on introducing a ‘market’ into the NHS. And this introduction of the market or ‘quasi-market’ has had a profound impact on resources and planning, as well as large charities. According to numerous news reports, a global study involving more than one million people to look at the influence of genetics and lifestyle in Azheimer’s disease will be led by scientists from Cardiff University. The £6m project will combine the power of multiple studies from around the world to explore the roles of genes and lifestyle choices to produce the most comprehensive understanding of the disease’s risk to-date. Information gathered by researchers from across the globe will provide scientists with the best evidence yet for creating a fuller picture of why the disease develops and the degrees of risk it poses to different individuals. This study clearly has implications for the future. 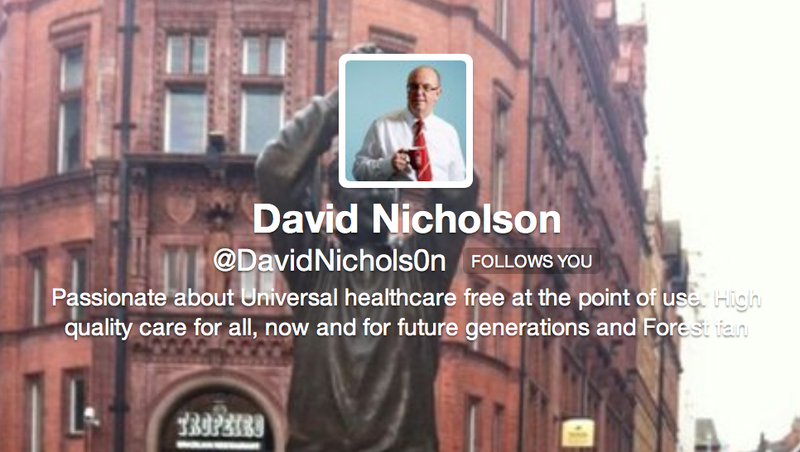 Sir David Nicholson spotted these implications at once. And in fairness David‘s starting point is fundamentally one of universality. CCGs, or clinical commissioning groups, do not particularly need to be manned by clinicians, though that it is how the concept has continued to be marketed to the public and GPs. They are simply state-run populations pooling risk, and there has never been any precise guidance on their exact size (in terms of number of people in each catchment). With such recent upheavals in health policy in England, with discussion of an insidious ‘privatisation agenda’, this online survey was undertaken with a view to working out whether members of a general public exhibited views with the functioning of private insurance markets. I completed a study. Respondents were invited from my Twitter account @legalaware with close to 12000 followers. There were 125 respondents in total. The sample is possibly biased, in that I have a predominantly left-wing follower list consisting of about 11000 followers of mainly well-informed people. However, in fairness, it is worth noting that certain key policy planks have cross-party support, including free-at-the-point-of-need and personal budgets. 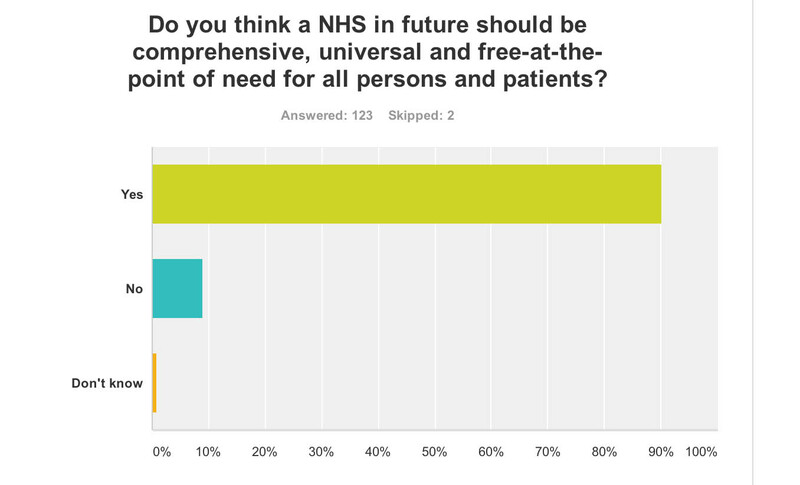 In answer to “Do you think a NHS in future should be comprehensive, universal and free-at-the-point of need for all persons and patients?”, 99% answered yes (n = 123). The problem with this is that opinions about the extent to which the NHS offers a comprehensive service is qualified by some degree of ‘rationing‘ already. 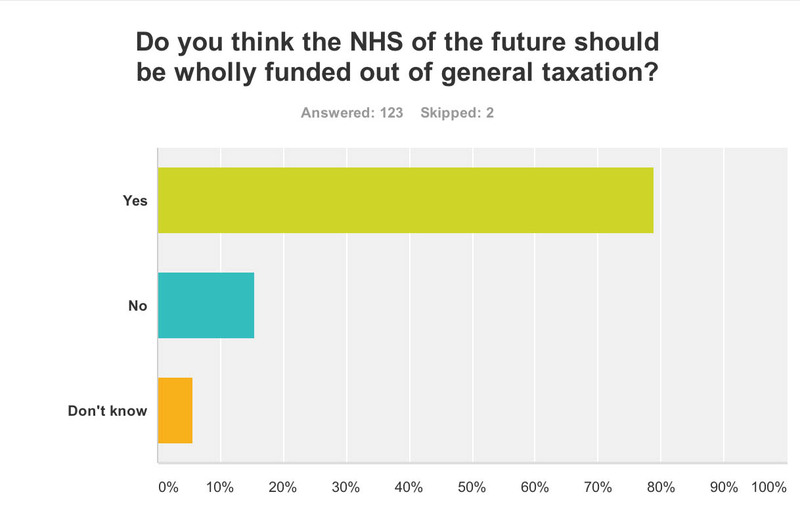 However, I did ask “Do you think the NHS of the future should be wholly funded out of general taxation?”. I used the word ‘wholly’ meaning completely. Despite this high threshold, 79% said ‘yes’ (n = 126). The NHS provides the majority of healthcare in England, including primary care, in-patient care, and long-term conditions. The National Health Service Act 1946 came into effect on 5 July 1948. Private health care has continued parallel to the NHS, paid for largely by private insurance, but it is used by less than 8% of the population, and generally as a top-up to NHS services. Attitudes in my survey are interesting in light of extensive media coverage for Lord Warner’s plan for a £10 top-up fee to be paid through council tax. This is further interesting as it shows a desire to avoid a private insurance-based system in the future. But others have argued including Caroline Molloy and Bob Hudson that it’s a “zombie policy”. 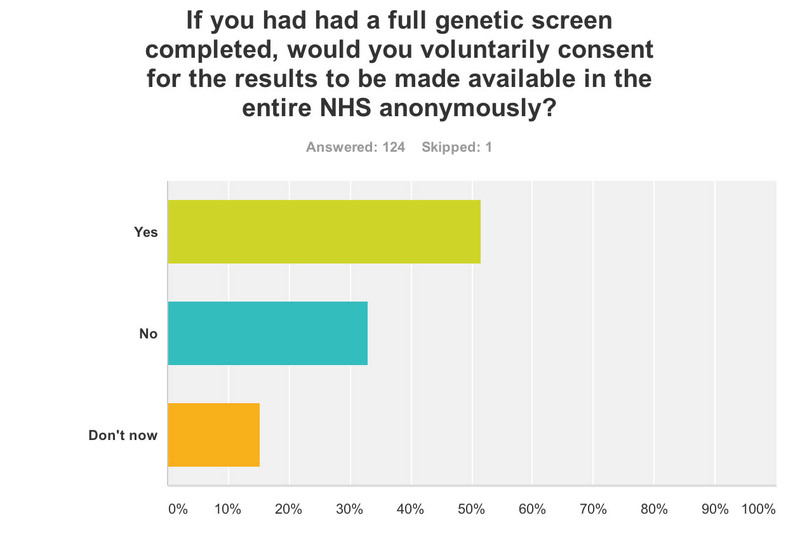 I also asked, “If you had had a full genetic screen completed, would you voluntarily consent for the results to be made available in the entire NHS anonymously?” This produced a very mixed response: yes – 52%, no – 33%, don’t know – 16% (n = 124). This is interesting in light of the ‘case finding’ approach in England, where a possible diagnosis of dementia might be chased up even if not initiated by the person directly involved, exacerbated perhaps in the drive from politicians and the Alzheimer’s Society for improved diagnosis rates. Such a policy clearly is problematic in terms of valid consent ethically. Notwithstanding the general issue comes up as to whether an individual should disclose the possible diagnosis of a dementia beyond even the confidential jurisdiction of his or her Doctor, and to share the information with the State. But this is the same problem which led Care Data to run into difficulties. It could be that the recent furore over care data, through the subject being badly managed by NHS England with the general public, may have impacted on this general lack of willingness of a member of a general public to share details of a genetic screen with the NHS at large. A consistent policy strand of late has been the desire to introduce personal budgets for dementia (and this is across all main political parties). The concept of a single unified budget has now come up consistently in various arenas: namely, the Fabian Society document on whole person care, the IPPR review of whole person care, and the Barker Commission of the King’s Fund last week. 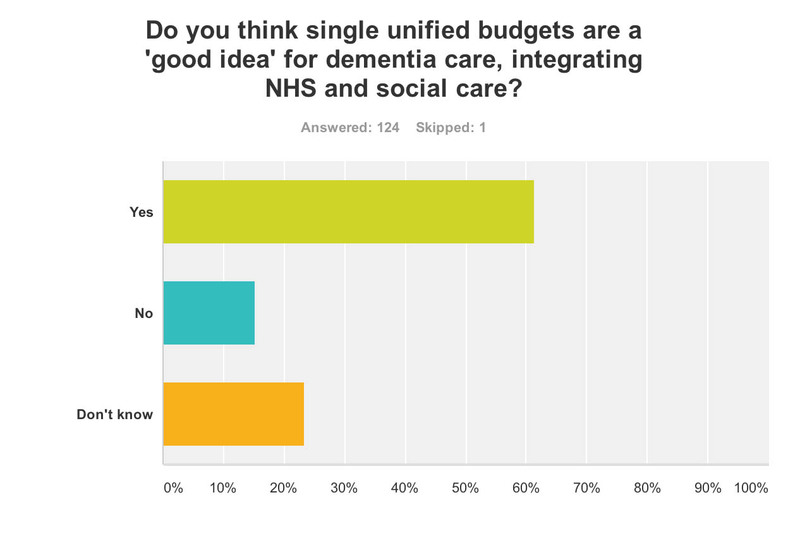 I asked, “Do you think single unified budgets are a ‘good idea’ for dementia care, integrating NHS and social care?”, and it is noteworthy that the majority (61%) said yes, with only 15% saying no. The proportion saying they don’t know (23%) constitutes, though, a sizeable minority (n = 124). Taken with the above finding with the general popularity of universality, one might infer that people generally don’t want to see single unified budgets as a backdoor mechanism of introducing care for which you have to pay extra. The uncertainty for this is indeed interesting. And so – therein lies the crunch. The devil lies in the detail? Profiling someone’s risk is exactly how private insurance markets work. They process your dividend according to your risk. There are concerns that the NHS is heading towards a private insurance system, if only to be integrated fully with one. 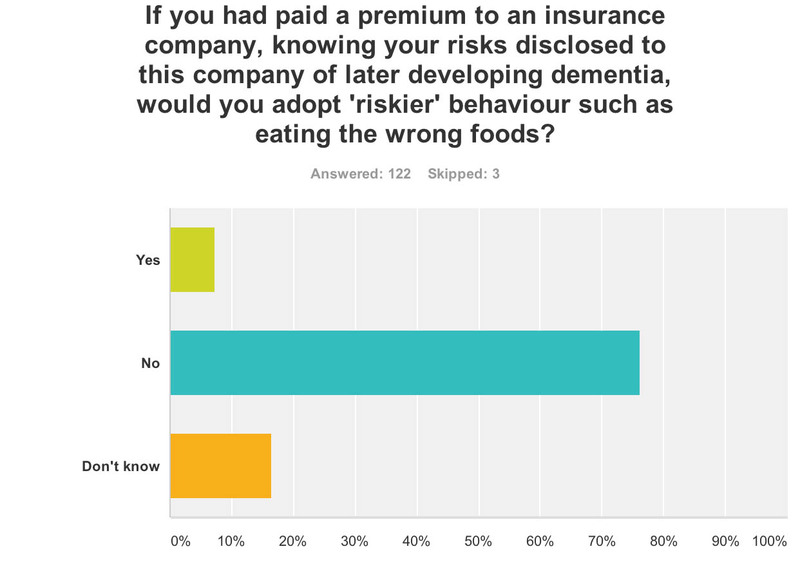 The question “If you had paid a premium to an insurance company, knowing your risks disclosed to this company of later developing dementia, would you adopt ‘riskier’ behaviour such as eating the wrong foods?” produced a very interesting observation. In economic theory, a moral hazard is a situation where a party will have a tendency to take risks because the costs that could result will not be felt by the party taking the risk. In other words, it is a tendency to be more willing to take a risk, knowing that the potential costs or burdens of taking such risk will be borne, in whole or in part, by others. A moral hazard may occur where the actions of one party may change to the detriment of another after a financial transaction has taken place. 7% said yes, but 76% said no (17% said don’t know) (n = 122). This for me demonstrates that the general population in this scenario does not behave like a typical insurance market for goods, and this could be something to do with a person will not wish to take risks with their personal health irrespective of the scientific evidence. And in fairness, a genetic risk for dementia might not be nearly as important as environmental factors for someone developing a dementia, and people are reluctant to take risks with that. 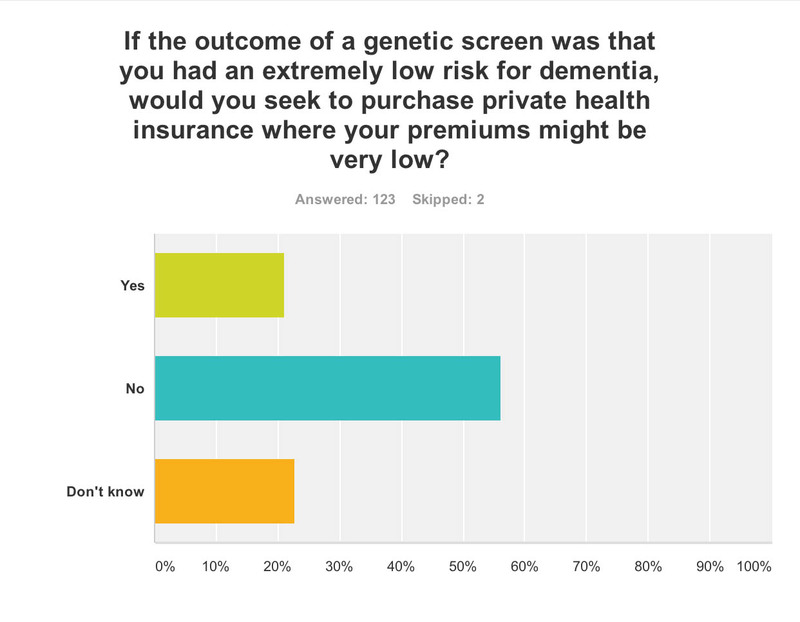 I asked, “If the outcome of a genetic screen was that you had an extremely low risk for dementia, would you seek to purchase private health insurance where your premiums might be very low?” Amazingly, despite 21% of respondents saying yes, 56% said no and 23% said they didn’t know (n = 123). The term adverse selection was originally used in insurance. It describes a situation wherein an individual’s demand for insurance (the propensity to buy insurance and the quantity purchased) is positively correlated with the individual’s risk of loss (higher risks buy more insurance), and the insurer is unable to allow for this correlation in the price of insurance. All respondents were in the UK. There might have been political bias in the sample, though it is useful to note perhaps that personal health budgets and a comprehensive universal NHS, free at the point of need, have currently cross-party support. Clearly a much larger sample is going to have to ascertain what these trends are. There is no doubt that the furore over care data sharing and the policy to improve diagnosis of dementia rates will have a legacy on future dementia policy, and possibly a very negative one. And finally, evidence from moral hazard and adverse election demonstrate that individuals assessing their risk for dementia may not behave like traditional insurance markets. Reasons for this might include the facts that adults in fact prioritise their own health and do not wish knowingly to put it to risk, they appreciate the rôle of factors in the environment which could throw havoc for insurers’ calculations, and that they have a deep-felt genuine ‘brand loyalty’ and affection for ‘that national religion’, the NHS. This is reflected in the following graphic tweeted recently. The negative publicity surrounding the Health and Social Care Act (2012) as regards privatisation may have played an important rôle here. This is all very problematic if the ultimate goal for increasing awareness of dementia was to boost the private insurance industry and Big Pharma. 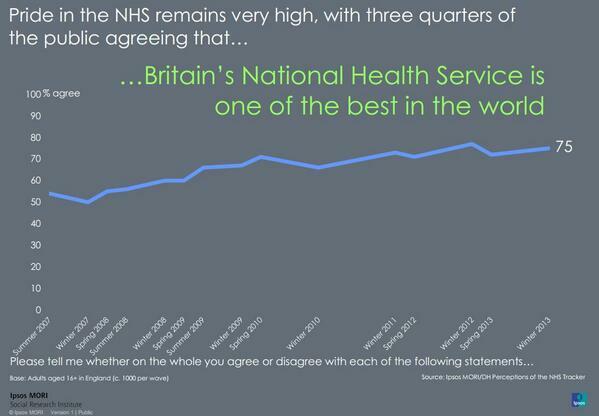 It looks as if the NHS might have the last laugh after all. McNeil, Clare, Hunter, Jack [for IPPR] (2014) “The generation strain: collective solutions to care in an ageing society”, link here.